This location is perfect for all of our rainy days during the winter when you want to take photos "outside" but not actually outside. Not only is it dry, it's also warm because the plants need warmth just like your kids! The light is glorious because of all the glass windows. In the summer, it can be too bright but in the winter when it's overcast outside, the conservatory has perfect portrait lighting. 3) So Many Cool Plants! Inside the greenhouse, you'll have lots of plant variety to choose from; tropical plants, desert plants and seasonal plants (in November and December they have holiday decorations with a Santa chair and toy train track). My favorite room is the desert room because of all the funky cacti that are so different than the plants we have outside in the PNW. 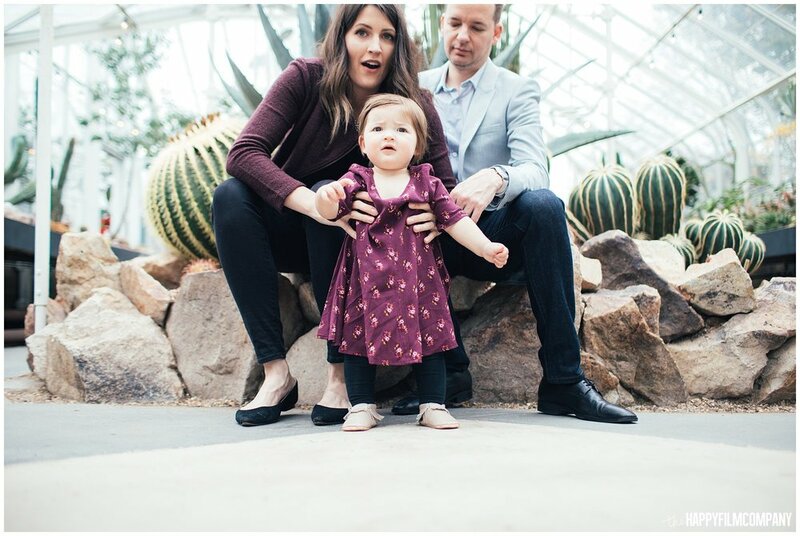 Our native plants are all dark green but the desert plants are soft pretty pastels (teals, pinks and creams) so if you like those pastel vibes, that might be the perfect room for your Seattle family photos! If you want giant leafy banana kinda leaves and your kids want to splash their fingers in a pond with some jungle vines, then the tropical room is for you. Some families like taking photos in ALL the rooms to get lots of variety and some families just choose one room and stay put so their photos look consistent (and they just like those plants best). 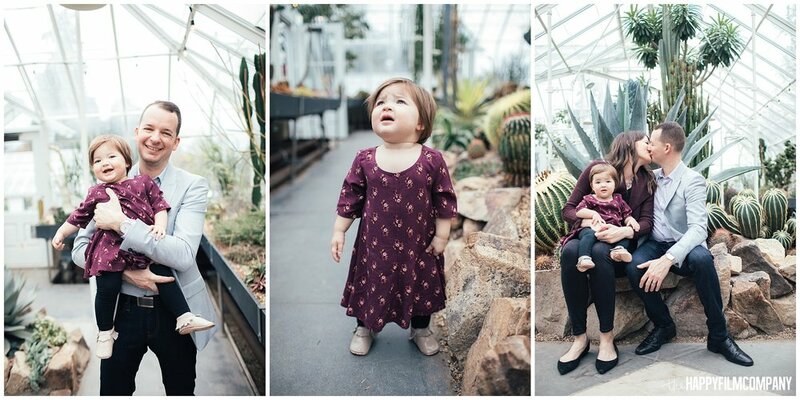 The only potential downside to taking your family photos at the conservatory is that we sometimes have to wiggle around other people and other photographers. We usually have to wait a moment for my camera to de-fog (haha) and if you wear glasses, you might need your microfiber cloth or whatever you use to keep em clear. The humidity can also feel a little heavy at times (it's really not that bad though) -- this is just a warning so if you're super sensitive your hair might frizz a little or you might feel a little sweaty. It can be a little bit squishy because we have to stick to the pathways and there isn't a big open area to run around in. For these reasons, sometimes this location is better for babies & younger kids that have shorter legs and might just want to hold your hand and cuddle. Older kids that have more energy that wants to explore and climb on things and be silly in photos will have lots to look at in the conservatory but they might prefer to be outside in the park. 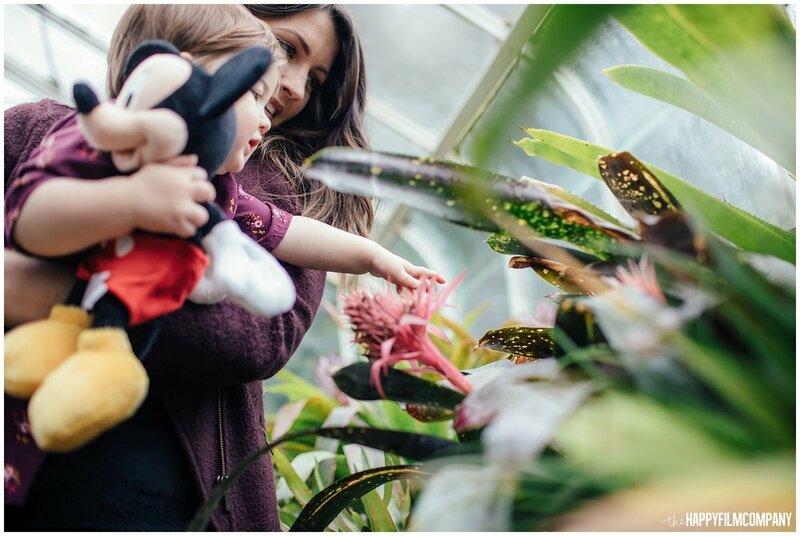 Luckily, the conservatory is location in the middle of Volunteer Park on Capitol Hill which has tons of grassy areas and forests to explore. All adults need to pay a $4 admission fee (kids are free).